Please provide a written referral for your patient before her first appointment at TasOGS. Referrals from GPs are valid for 12 months from the date of referral, and for 3 months from other specialists. 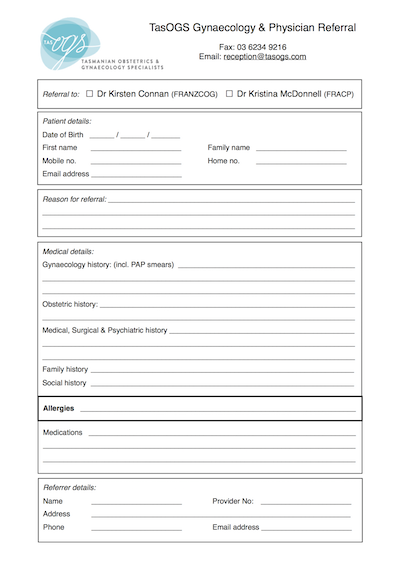 A suitable referral form can be downloaded below for both obstetric and gynaecology/medical, or you can write a referral letter on your own letterhead. Completed referrals may be faxed to the TasOGS practice on 03 6234 9216, emailed to reception@tasogs.com or sent electronically via Argus. A TasOGS receptionist will contact your patient directly with her appointment details and TasOGS practice information once a referral has been received. Full name, date of birth and contact details, including mobile number and email. Presenting problem and urgency of review. Medications, any known allergies, smoking history & social supports. For obstetric referrals: current estimated date of delivery or last menstrual period, past obstetric history, PAP history, and relevant past medical, surgical, psychiatric & family history. Please forward the result of any relevant blood & urine tests, ultrasound or other relevant investigations for your patient. We will always correspond with you after review, and after any significant event such as surgery or delivery. If any urgent issues arise during our care one of our specialists will always contact you directly about your patient. 6214 3333 if you require any further information. Our specialists are always available to discuss urgent referrals with you if you require.